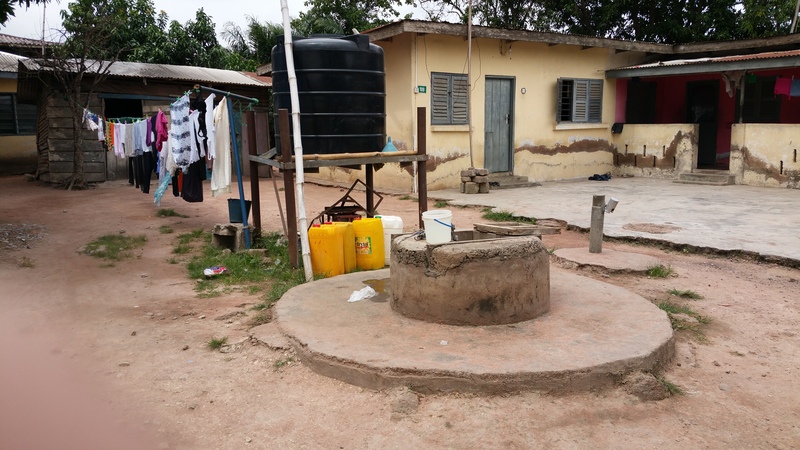 In the rapidly growing city of Dodowa in the Greater Accra Plains area in Ghana, most households have a bath and kitchen, while toilet facilities are generally inadequate. Compared to Bwaise and Unga Ltd/Sombetini, housing quality is better. Water supply in Dodowa is mainly from the Volta river. Currently, it is estimated that the Ghana Water Company Ltd. and the Community Water and Sanitation Agency supply potable water to around 65% of the inhabitants of the area. The remaining inhabitants depend on groundwater in the form of dug wells and boreholes. These are mainly the urban poor. In addition, groundwater is also used for irrigation, and the production of sachet drinking water. Due to the inadequate sanitation, most waste water is disposed of on-site, where it infiltrates into the aquifer. Although Dodowa has relatively better living conditions than Unga Ltd. and Bwaise, the urban poor seem to be in a comparable informal situation with the lack of general basic services. In our research, the urban poor, and their dependence on groundwater will remain our focus, and it is scientifically interesting to compare urban poor and their groundwater dependence in a relatively well functioning institutional setting (Ghana) with those in a relatively ill functioning institutional setting (Uganda, Tanzania). The second reason to include Ghana in our research is that during the SWITCH project, Dr. Oduro-Kwarteng, who is part of our research consortium, was already involved in a Learning Alliance approach in the center of Accra. His experience is useful in current research.